I'm starting a new series. Actually I started it before but didn't keep up with it, didn't have a fun button, didn't promote it, etc. Food on Friday will now be a regular feature. With my family's crazy, busy schedule, sometimes getting food on the table can be a challenge. I'm constantly looking for meals that are easy to make and that the small people will enjoy. I know I am not the only mama who has this challenge. Right? So starting next Friday, each week I will share a recipe that I've tried recently. I'd like to invite you all to share your recipes as well, so I'll have a link up each week too. 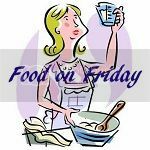 If you want to join in, you can add the Food on Friday button to your posts or to the sidebar of your blog. Leave me a comment letting me know if you'd like to be added to my mailing list to get a reminder email to link up your recipe each week. Thanks!